For nearly two decades, I’ve been the wife of a police officer. Invariably, friends whose husbands do not require body armor to go to work ask how I cope with the inherent dangers of his job. They ask, as politely as possible, how I can live with the every-present possibility of being widowed and having to raise five children on my own. “How can you let him be a cop?” they ask, incredulously. Whenever I encounter someone who asks me how I can “allow” my husband to be a police officer, it reveals a profound misunderstanding of his vocation. They see being a cop as something he does, whereas I see it as who he is. His vocation is as much a part of his makeup as his gorgeous blue eyes or his fantastic sense of humor. To ask him to set it aside for my own comfort would be like asking him to stop being kind or funny or intelligent. And what if I did decide to pressure him into a different career? Instead of making our family life less stressful, it would gut it of all genuine peace. God gave my husband personality traits that make him ideally suited for police work. He possesses profound compassion and steely strength. He can read body language intuitively, which gives him the ability to detect lies in a person’s most minute movements. But he also has an unshakable faith in Divine Providence even in the face of profound evil. My husband’s desire to serve others and his innate sense of duty and honor made him a public servant before he ever put on the uniform. To insist that my husband give up police work would rob him of the most natural and fitting outlet for his God-given personality and talents. It would give him a restless soul and make him unable to enjoy the time he spends with our family, time that is valuable and precious, but altogether different from the time he spends as a cop. The fulfilled man that joyfully scoops up our children into his arms each evening (or morning, depending on the shift) would disappear. And he would probably be replaced by a deeply unhappy man who is unable to be fully present to those he loves. Part of what puzzles me as the wife of a police officer is the assumption that I want my husband to do something else. People just assume I tolerate his job, but that I would really rather he be putting on a suit and tie and going to an office every day. Admittedly, thinking about my strong, noble husband wrestling down a vomit- or urine-soaked drunk or desperate drug dealer is not exactly a turn-on. But knowing what that struggle represents—his willingness to risk everything, including his life, to protect the innocent…well, that’s every woman’s fantasy. The gun and the shaved head certainly help, but there is no aphrodisiac quite like being married to a modern-day knight. A silk tie will simply never compare to a Sam Brown. Besides that, I put his life–and my future–in God’s hands. 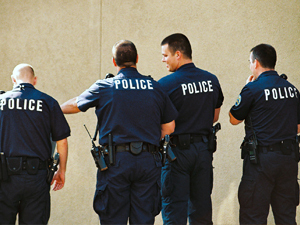 We know cops who have survived near point-blank, repeated gunshots, with the bullets appearing in the wall behind them. We’ve known others who died after a rogue bullet found the tiny unprotected spot in their vest and severed a vital artery. My husband even has a video of himself squatting down preparing to spike the tires of a man in a pursuit, who suddenly veered in his direction to run him down. A split second before the car would have hit him, my husband flew backward, his face just inches from the vehicle. The video shows him being pulled backward from the back of his belt, almost as if someone invisible (and very strong) had yanked him out of the way of the car. All of these scenarios have convinced us that his work, while physically riskier than some, makes him no more vulnerable to dying than the man who works from his home office every day. People forget that God, not us, has true sovereignty over life; we come into this life and pass out of it at His good pleasure, not ours. But the biggest reason I choose to encourage my husband in his vocation is that it’s a witness to our Catholic faith that’s so desperately needed in our world. Every day, he risks his life to serve and protect the most vulnerable among us. He willingly stands between the most violent members of society and the rest of us. Countless men and women who wear the badge have willingly sacrificed their lives to protect others. “Greater love has no one than this, that he lay down his life for his friends.” (John 15:13) The most remarkable thing about my husband is that he would die not just for family or friends, but for total strangers. It’s no wonder, then, that while I love my husband, I love my husband the cop even more, because he shows Jesus to me every time he goes to work. In a world that depicts men as either buffoons or tyrants, it’s up to us, ladies, to reclaim the honor and dignity that belongs to our husbands. If we’re to see Jesus in every person, the easiest start is to begin with the man gracing our homes. So tell us, readers, how does YOUR husband reflect the beautiful heart of God?